A child’s first steps are an exciting time, but it can be scary too. As infants learn to toddle about on their own, they gain independence. And the learning curve on a steady gait can be precarious, as they’re still learning the mechanics of their own tiny bodies. The baby walker, a tool that’s been around since the 15th century, is a great way to help children along their path. Just be certain that you’ve baby-proofed the house if you’re going to give them free rein in their cute little walkers. When you feel confident in your baby-proofing, it’s time to pick out the walker that’s just right for them! We have fun designs and walkers with interactive features. Strap baby in and buckle up for the ride, because it’s a journey for the both of you as they learn to venture out into the world on their own. When you baby is starting to sit and be steady it is time to move on to a walker when you feel comfortable. We have reviewed each of the walkers on this list and corrected any issues with the links. Each product has an updated criterion and has been checked to make sure it is current in the marketplace. 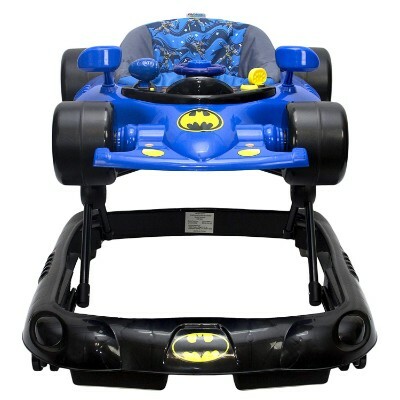 Gotham’s in trouble and only your little tot can save the day! 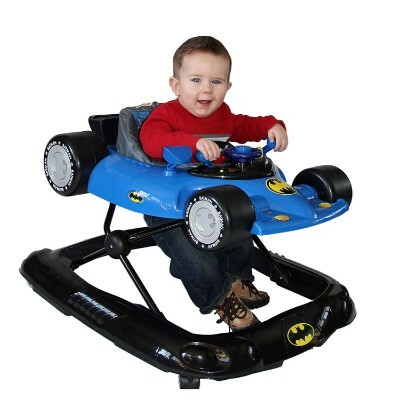 This darling KidsEmbrace walker comes in the style of Batman’s infamous Batmobile. It features a steering wheel, key, and gear shifter. The walker makes sounds and lights up when in motion, and the engine plays ignition sounds as it vibrates. It’s sturdy, with four wheels and six grip pads, but lightweight enough not to impede upon baby’s mobility. A comfy foam seat comes with a removable polyester cover that’s machine-washable. This walker collapses for easy storage and travel when you unhook the child-proof security latch. Suitable for children up to 26 pounds and under 32 inches who can support their own body weight, this Batmobile is a darling way for your little superhero to start taking their first steps. Baby walkers give growing infants a safe and supportive way to test out their legs and motor functions. Children need support as they learn to walk, and while mom and dad’s help is the preferred support system, no one can keep baby standing all the time. 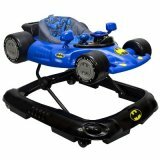 You can adjust the height, it has brakes and safety locks to keep them safe around stairs, and its vintage Batmobile design is pretty precious. 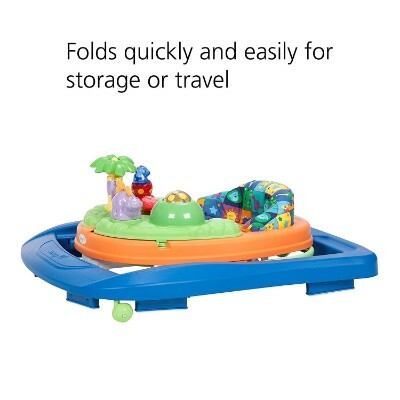 Baby will also love the interactive and removable activity tray, complete with a little steering wheel and noisy gadgets. 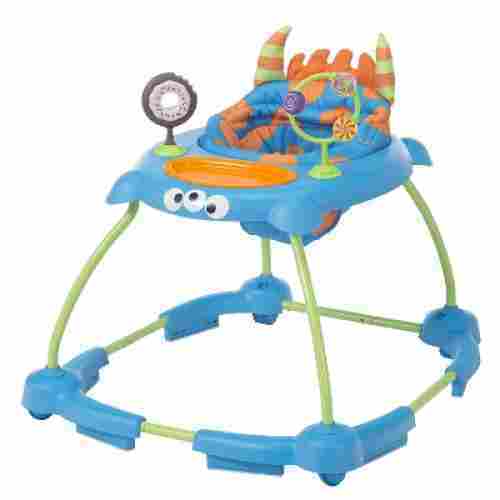 Walk your baby through the Jurassic Age with this sweet Safety 1st Sounds n’ Lights Discovery Walker. 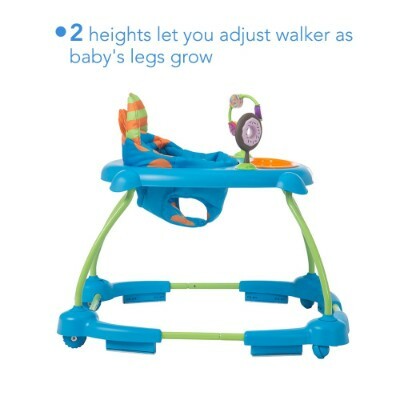 The walker features three adjustable heights to grow with your baby as they chase their dino friends around. 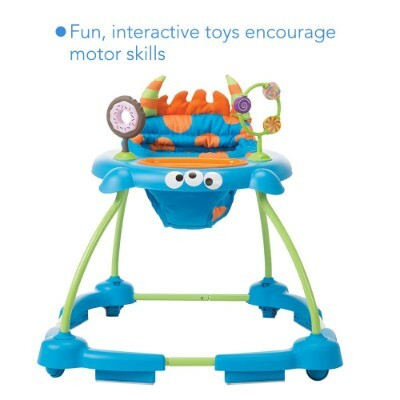 Five prehistoric toys (including a little dino tot popping out of an egg) encourage developing motor skills, along with a selection of lights and sounds triggered by different buttons and triggers on the walker. 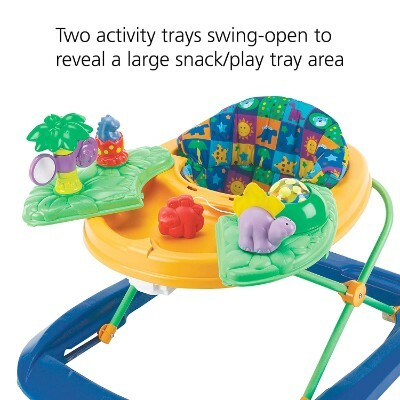 The activity tray swings to the side to reveal an additional, larger tray that’s just right for snacks and other toys. The dino-print cushion detaches and is machine washable to make clean up easy and quick for parents. To store it, simply fold the walker down into its outer frame and put it away until the next Jurassic journey. 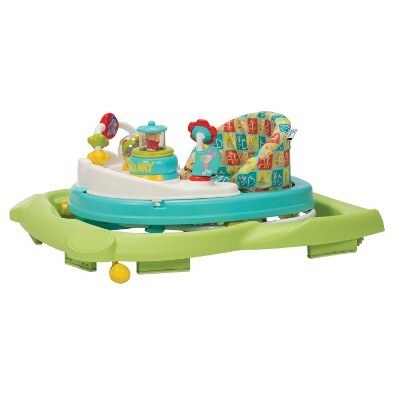 Toys spin, crinkle, rattle, and light up while twelve different songs and sounds underscore your baby’s playtime. Sensory toys help developing motor skills, so the more stimulating and safe activity in a walker, the better. It’s as durable as it is darling. 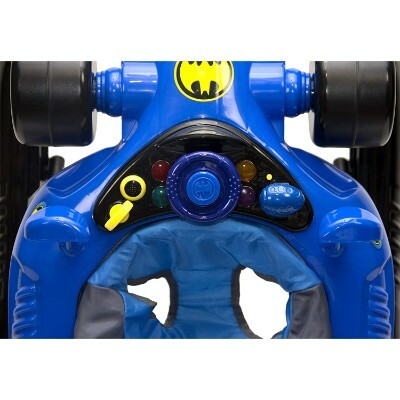 There’s plenty of excitement spread throughout the toys, sounds, and lights, and it’s a cinch to store and clean. Is your nugget ready for nautical adventures? The Baby Einstein Baby Neptune Walker is a wonderful dive into the deep blue sea for seafarers that are still too young to swim. The unique elliptical design means a sturdier base and less probability of tipping. A perfectly proportioned steering wheel lights up and makes ocean sounds when employed. The high seat back lends extra support to your growing child, and the Baby Neptune turtle PlayStation is removable, with additional storage space for other toys and activities. The walker supports roughly 16-25 pounds and can be adjusted for your baby’s height. 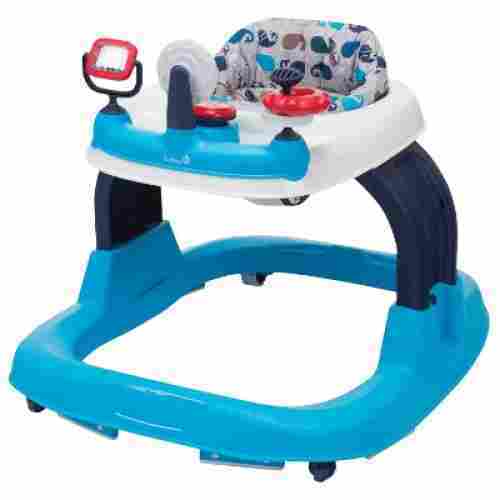 Sit back and watch your little one cruise around in this fun, durable walker. 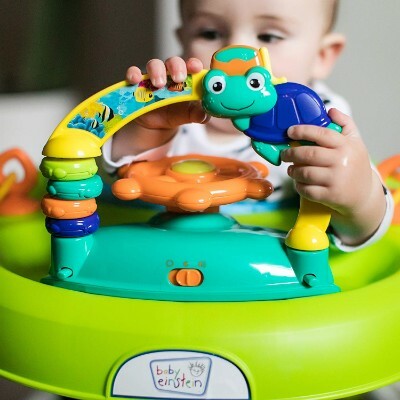 The turtle friend and steering wheel are sure to titillate your tot while they explore. 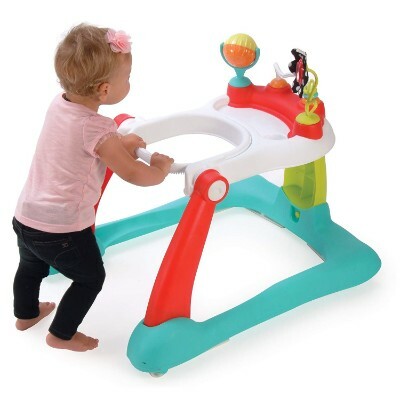 The activity tray is exceptionally easy to remove, so if you’re looking for a walker that provides space for other toys and snacks, this is a great option. The elliptical design and higher seat back are also great advancements for baby’s safety and comfort. No need to be afraid of monsters under the bed or in your walker when they’re friendly! This Cosco Simple Steps Walker features the silly Syd design. Syd is a friendly monster who brings interactive toys to the table for your child’s growing motor skills. 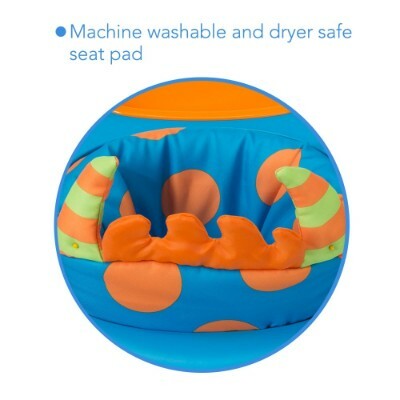 The seat pad is removable and machine-washable as well as dryer-safe. The insert tray can likewise be detached and put through the dishwasher. Two height settings allow you to adjust as your baby grows and their legs lengthen. Meant for children under 30 pounds and shorter than 32 inches who can hold their head up, this simple walker is easy to set up and take down. A cute little donut and candy whirligig will keep baby occupied when they’ve hit their step count for the day and want to take a rest. This walker lets baby start to wander autonomously by giving them the support they need to get used to their legs without putting too much weight on them. 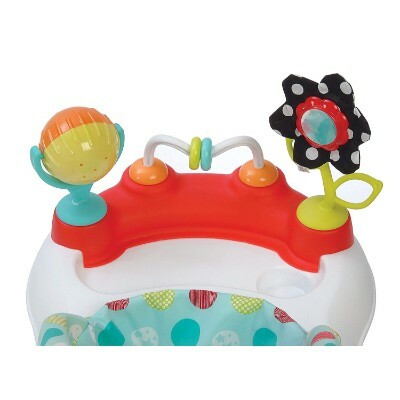 The interactive toys make this a great stationary playtime activity as well and will encourage developing motor skills. This walker is simple. There aren’t a lot of bells and whistles, but it’s sturdy, and there are two interactive toys for baby to play with on the detachable tray. The monster design is pretty cute, and it’s a steal for the quality. 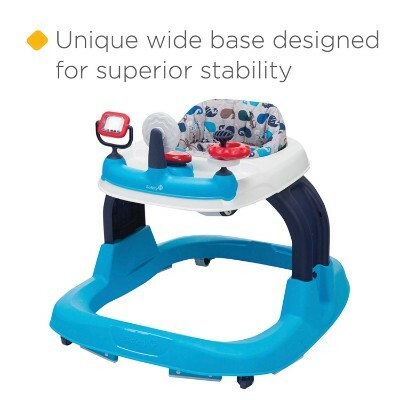 This great walker from Kolcraft can serve your baby through two stages of their learning process, serving as a full-support walker when they are first learning to stand and then as a push-along walker once they become more sure of themselves on their feet. This product includes built-in toys that will fill their time with productive activities, helping them to get up and going more quickly. Kolcraft here provides a great two-in-one activity walker for your growing baby, giving them a safe way to explore the home. 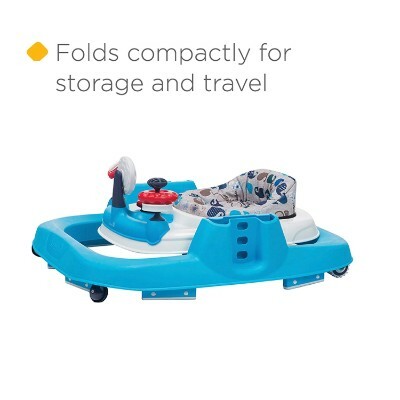 The space saving design will make this product convenient to store when they aren’t using it, and the skid resistant base will keep them from taking tumbles when they push the walker. This great walker option from Kolcraft will serve your child well through multiple stages of their learning process. If your little one is almost ready to walk, skip through, and explore the hundred acre wood, let Pooh and Friends guide their way. 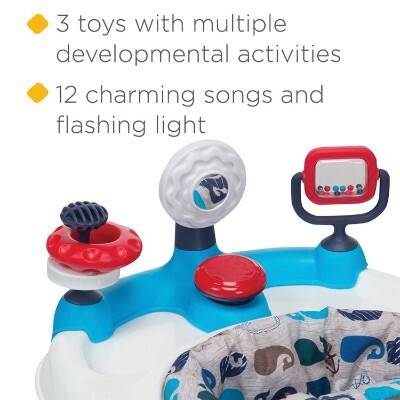 This Disney Winnie the Pooh Music and Lights Walker boasts two swing-open activity trays with four cute little Pooh-themed toys and twelve songs. Pooh pops in and out of his Honey Pot to say hello to your child, while Piglet offers up flowers, and Eeyore sits, flashing a rare smile. The walker has three adjustable heights, supports up to thirty pounds, and is meant for children aged four months and above who can already independently hold their head up. 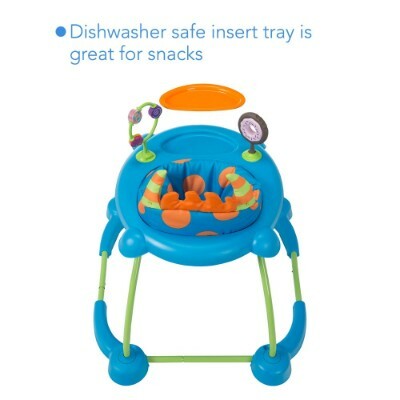 An oversized snack and play tray leaves room for additional baby toys or fuel for all the fun. The wheels are carpet, tile, and hardwood -friendly and the padded seat cushion is detachable and machine washable. 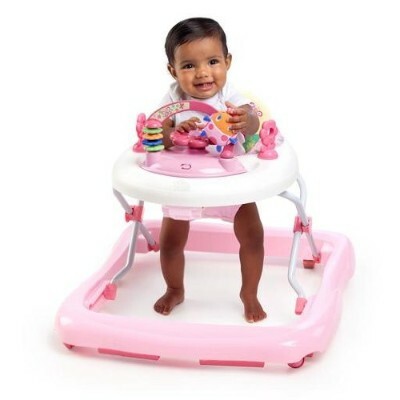 This walker features a variety of toys and safe objects for your little one to explore while they work on getting their steps in. 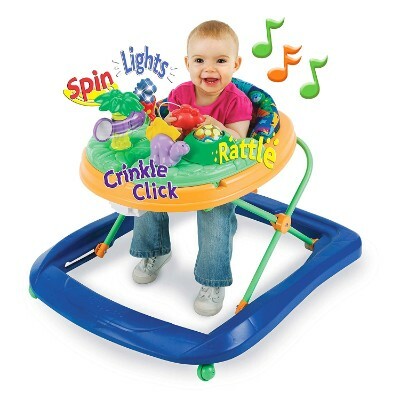 The music is a nice touch to help engage their growing senses, and the walker has room for additional toys or food. It’s fun, cozy, and it folds down for easy storage and travel. The Winnie the Pooh theme is cute and entertaining so baby will have plenty of stimuli. 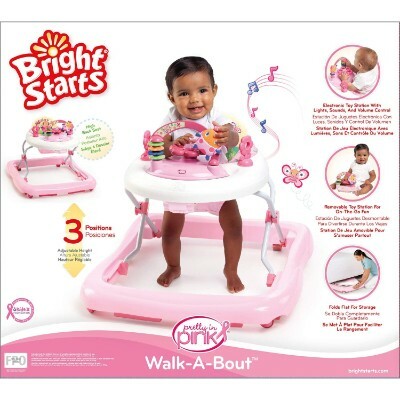 If you have a bright little ball of energy learning to walk in your home, this vibrant product from Bright starts is perfect for you. 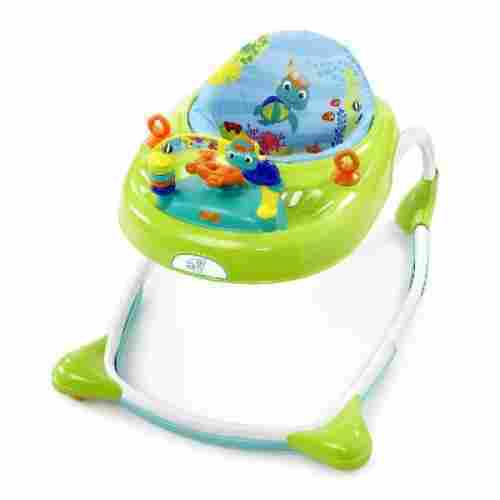 This set includes several beautiful electronic toys for your baby to play with as they learn to stand and walk, and the adjustable height will work for them as they grow. 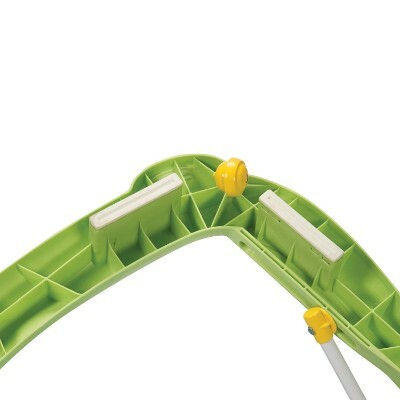 The walker also includes extra loops for adding toys in the future, giving you the option to customize the array of toys that they play with as they walk. This product from Bright Starts will entertain and train your child into healthy habits and motor skills, keeping them out of cabinets and off of stairwells all the while. The foldable design will stow away easy, and the high seat back will be comfortable and supportive for them. 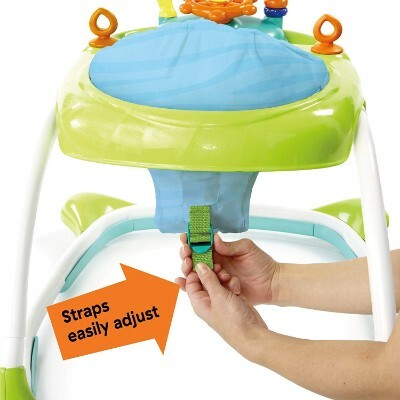 This product will entertain and train your child into walking easily safely, and keep them entertained in the process. 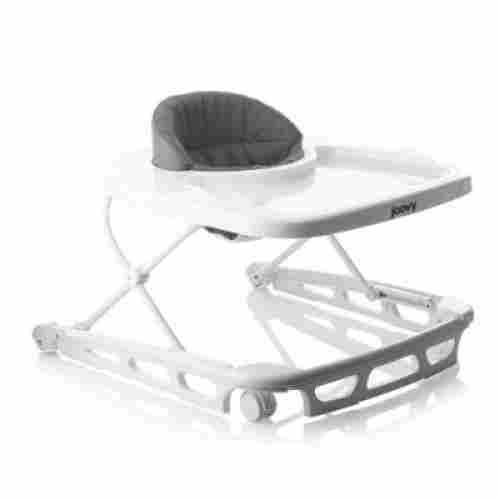 Joovy’s Spoon Walker is not one of your cheap baby walkers as this comes with all the certification of a high quality product. It features a clean and very contemporary design that makes it easy to clean. The seat can be easily removed and just thrown into the washing machine for instant cleaning. The walker has 3 adjustable heights so it grows with baby. 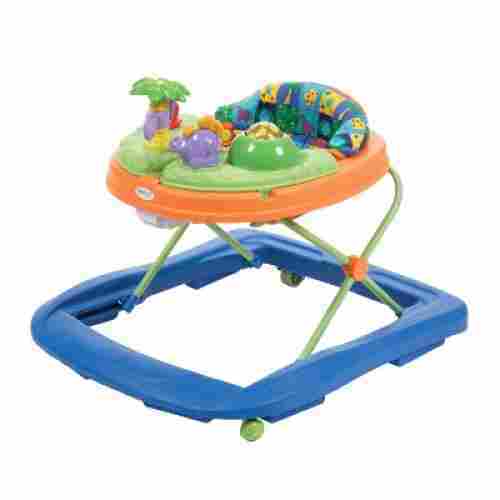 Even when baby is already a toddler, he or she can still sit comfortably in the converted toddler walker. Not only is this walker great for it’s sleek and minimalist design, it is also highly practical! 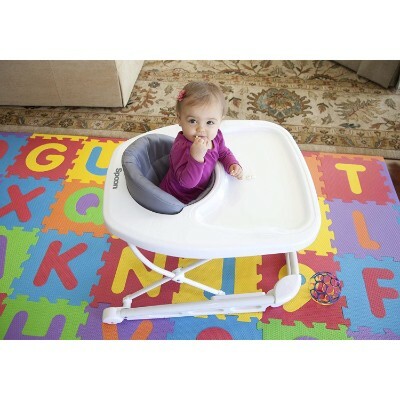 Not only can baby sit, stand, and walk in this, the serving tray attached allows for toys to be put within easy reach. It can also be used as a tray for snacks and feeding time. 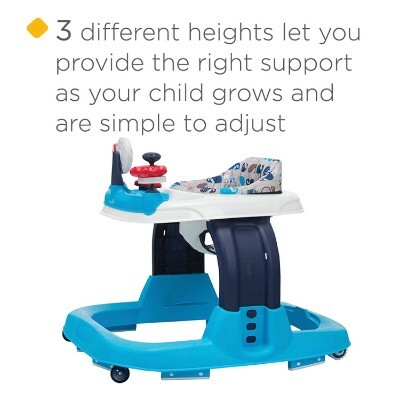 The durable base and platform, allow for incredible support and safety for your child until they’re ready for something a bit more adventurous. We love its very simple and minimalist design, particularly its all-white frame. The seats are made of soft yet durable materials for baby’s optimum comfort. 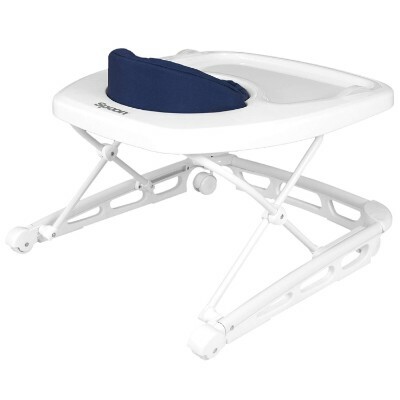 Its wide base means optimum safety for baby as well. If you happen to see a Spoon baby walkers for sale, we strongly recommend grabbing one. 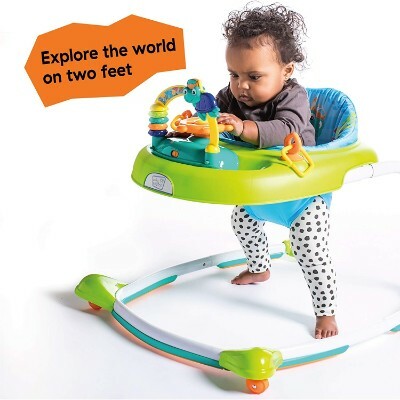 This great walker from Safety 1st offers your baby a few diversions as they toddle about the house as well as a flat space for snacks on the go. 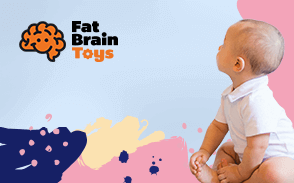 This product includes three built-in toys that are geared towards the development of your baby’s cognitive and motor skills, and the comfortable, machine washable girdle won’t chafe your baby as they take those important first steps. 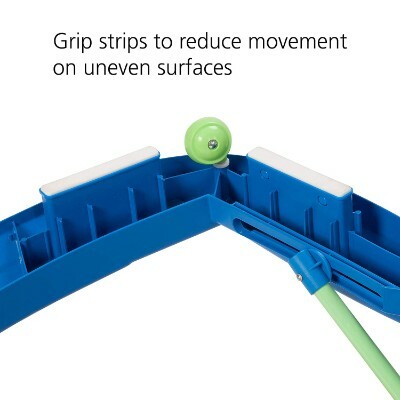 This product will keep the attention of your baby in a productive place as they learn to walk, helping them build hand-eye coordination as they build up their leg strength and balance. This set will have them walking on their on in no time, and they won’t be rifling through cabinets while they’re playing with this walker. 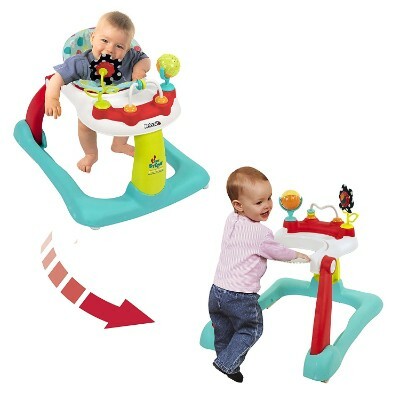 This is a great activity walker for your baby, one that will help them develop important motor functions and keep them entertained for hours. 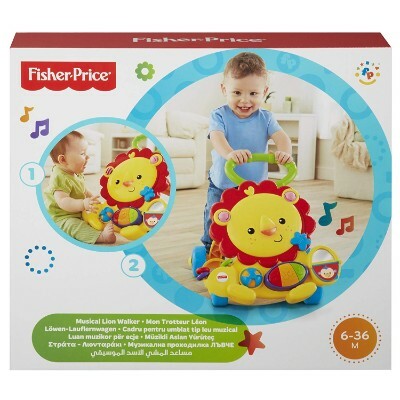 With very bright and lovable lion design, complete with its round red-orange mane, the Musical Lion Walker is something that any baby, who is already learning to walk, will surely love. It features a spinner, a flipper, and other interactive elements that either play fun music and melodies for kids or light up or even both. 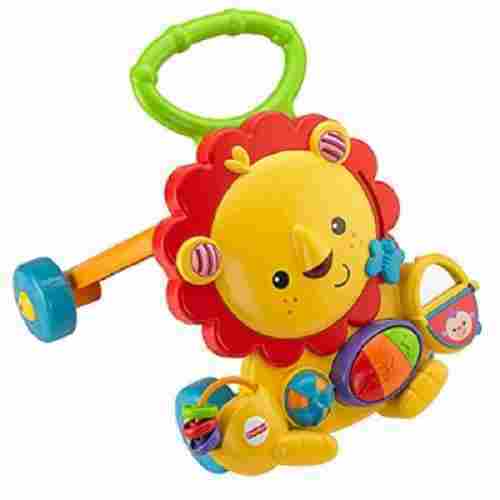 The Musical Lion toddler walker can be played with the baby sitting up or even standing. This little Lion walker is easily the King of Toys in this selection! With the walking musical accompaniment, your child begins to easily associate walking and movement with the function musical function and purpose of the walker. The wonder of this will lead to repetitious behavior and patterns….before you know it, you got a walking, joyous toddler on your hands! Standing or sitting, it just doesn’t quit, with flippers and handy music puller on the lion’s mane! The different activities can help babies discover cause-effect relationships, develop their language skills, and help develop their problem solving skills. The walker itself can help strengthen leg muscles, coordination, and balance. We wanted to get the right balance of engagement versus play. Some infant walkers come with many bells and whistles, thereby confusing the child and creating stimulus overload! And, while we can appreciate the desire of parents to provide only the best, new fangled thing on the market, it’s not always the best in the long run. With our products, it was hard-pressed to come up with more than a handful of negative reviews or cons from parents. Depending on what the needs of the child and parent are, a range has been provided from the busy V-Tech sit-to-stand to the more minimalist Joovy spoon walker. Each one with its own unique and desirable traits. Our list here can never be fully comprehensive, which is why it is encouraged that each check in with him or herself, do their own research; observe their child. The answer will be quick to come, and we will have just what they need! Walkers can develop and encourage more the sense of curiosity, exploration, and development in a safe way! There is always some nook or corner your child will try to get into or reach for! With proper supervision, some things can be more easily attainable (milestones, accomplished) with the aid of a walker, while the parent is there to cheer them on! The important part is to keep them supervised, baby-proof the room, and don’t leave them in the walker for too long. The walker should not be used as a substitute or crutch from the child learning to walk on his or her own. Choosing the right baby walker is never easy simply because everything technically has the same basic components-–a wheel and a mechanism upon which baby can hold onto while mastering his or her steps. So, it all comes down to the existence of additional features that can further enhance the growth and development of babies. In such cases, we have to make sure that the different features are also developmentally appropriate and can really help enhance certain developmental skills that babies need to master. 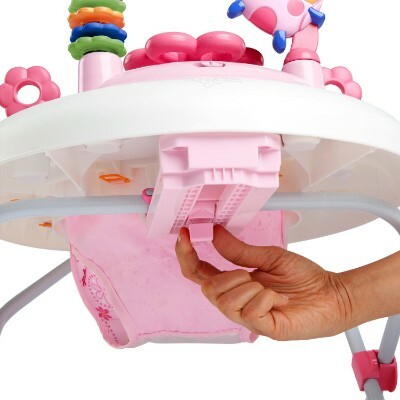 Additionally, these features must be safe to operate as well as made of baby-safe materials. We also had to look at the hundreds of reviews from customers, consumers, and parents who have first-hand experience buying, assembling, and letting the product be used by their respective children. The toy manufacturer’s credibility and trustworthiness have to be considered as well. We took all of these into consideration as we scrutinized every baby walker to present to you our list of the leading baby walkers for infants this 2019. That before you start using a walker in your home with your baby that the number one priority should be to baby proof your home. You would be surprised on what they can reach and how they can get right up to coffee tables. Also make sure that all furniture is secure. Remember that walkers are a great way to get baby used to being up right, but it should not replace time spent on the floor playing with toys. There is nothing better than seeing your baby take his or her very first few steps. This is a very momentous occasion simply because it already signals nearly developed gross-motor skills, balance, and coordination. In a few more months, your baby will already be exploring his or her new-found world. With well-developed motor skills, young children will be able to explore their surroundings a lot better, enabling them to learn more, and help foster a sense of independence and autonomy. This can help in the development of a healthier self-concept which starts with self-confidence. As confidence in themselves grow, children also learn to interact more actively with their environment including adults and other children. This, in turn, is what promotes the development of social skills. 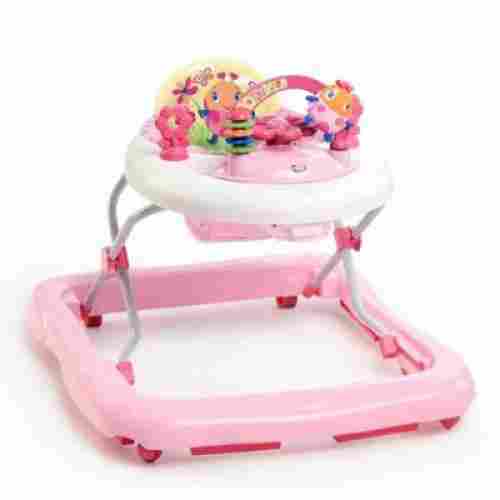 Baby walkers are thus important in helping young babies initiate their very first steps. And while there are a variety of ways in which we can teach or help our babies learn to walk, the use of baby walkers are generally believed to be one of the most effective ways to help encourage babies to take large steps toward independence. Learning to walk takes several stages which starts with mastery of babies’ control of their head and neck muscles. By the time they are 4 to 7 months old, babies can already start sitting on their own. Toward the 8th month, they will already be so adept at crawling-–their very first chance at mobility, moving on all fours. This helps them strengthen their leg and arm muscles. Around this time, usually by the 8th month, they will already be pulling themselves up to stand. They can hold onto the railings of their baby cribs or even hang onto the fingers of mom or dad to pull themselves up. This is now the time for them to really plant their feet on the ground. Just another month and they will already be taking those steps but with the support of mom or dad. Around 9 to 10 months, they will already be cruising along, holding onto furniture to go where they want to go. Toward their first year, usually beginning in the 9th month, babies will already be able to stand without support or any form of help. And this is one of the developmental cues that baby is already ready to walk on his or her own. If he or she can already balance standing on his or her feet for several seconds, this will encourage him or her to try to take those crucial first steps without support from mom and dad. And this is where baby walkers can greatly help. By providing support for their young muscles as well help provide safety against falls, baby walkers are simply one of the most efficient tools for helping babies learn to walk. However, baby walkers are not only beneficial for motor development. Some baby walkers also come with a variety of fun learning activities to help with their cognitive development particularly thinking and problem-solving. These may not be as complex as the cognitive processes seen in older children. However, these do provide the foundation for the development of more complex cognitive processes such as logical reasoning and critical thinking, divergent problem-solving and counterfactual reasoning, and a host of other mental abilities. Baby walkers are not just tools for encouraging babies to strengthen their muscles, develop coordination and balance, and enhance other psychomotor skills. More importantly, baby walkers can help foster babies’ sense of independence and encourage exploration which can all enhance his or her understanding of the world around him or her. It is for this reason that many parents give their infants baby walkers. And if you are looking for a baby walker yourself, we are optimistic our list of the 10 top baby walkers will help you choose the best one for your baby. q: Why are all the baby walkers listed so expensive? Much of it has to do with the manufacturer's cost of production and shipping! There is the reputation of the company as well that puts a certain “gold standard” to a product; in addition to the number of accessories, as well as warranties and the writing of user manuals. 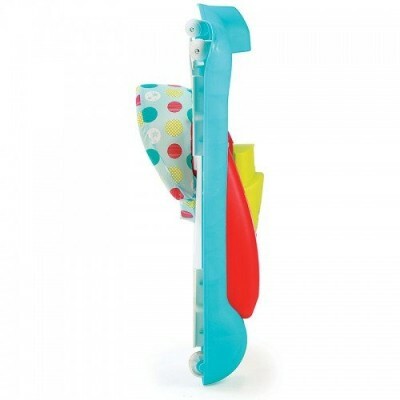 Another example is considering the complex safety features of the Joovy Spoon Walker. More labor went into producing the Joovy product as opposed to others. q: Some pediatricians don’t believe in the validity of walkers, why should I buy one? This is left to the discretion of each parent and couple in deciding what is best for their children. Research has shown that there is some benefit, even if it is not extensive or all-encompassing. Our products are like anything, something to be used in moderation. It is never suggested that a child is in continuous play or use of a product. Walkers are used as an aid, a tool, just as training wheels on a bike--at one point, the wheels must come off! q: Will walkers replace crawling? This is highly unlikely! This has been a major concern of quite a few pediatricians and child experts, though! Crawling is an essential, fundamental and vital stage in the development of a child. Just as there’s the old adage, “you have to walk before you run,” so a child must crawl before walking! It’s right for the parents to find a healthy balance when it comes to their child’s development. q: Will a walker help my infant walk sooner? Each child is different. Walkers may not help a child walk sooner, but it will start building neural pathways in that direction. Overuse of the walker has the possibility of atrophying the ability to balance properly on his or her own. Each case is different, but each stage of your child’s development should equally be savored and enjoyed. q: How durable are these walkers? That depends on the walker! Each one you purchase has different specifications. While we stand by the overall durability of all our walkers, we can’t account for how rough your child can get with them. If an older, heavier child decides to put their full weight on the product, it may break! The walker is to help gauge balance so that the child him or herself can find it on their own. The child can tilt, the child can sway, it’s up to the discretion of each parent. q: What does the “grow with your child” feature mean? Typically, a "grow with your child" feature is meant to evolve to the changing style of play that your child develops as he or she gets older. It can also incorporate certain height and weight parameters. Often a feature like a learning activity center can remain relevant to the life of a child until the ages of 3 to 4. Their knowledge and cognitive abilities aren’t too far advanced during these preschool years.